Beverly Hills: Sunday, November 8, 2015, 6:30 p.m.
Redondo Beach: Monday, November 9, 2015, 8:00 p.m. Thousand Oaks: Tuesday, November 10, 2015, 8:00 p.m.
Pasadena: Wednesday, November 11, 2015, 8:00 p.m.
Best known for his brilliant humor and classic TV and film performances, John Cleese is also an extraordinarily popular lecturer who enthralls packed audiences worldwide. “The world’s funniest man” first made his mark as a member of the legendary Monty Python troupe in the 1960s, and has gone on to write, produce, direct and star in some of the greatest comedic hits of the last forty years, even receiving an Oscar nomination for best screenplay for A Fish Called Wanda . He created a unique comedic style that has inspired countless writers and comedians. An instigator of some of the more groundbreaking developments in twentieth-century comedy, John Cleese is one of the world’s best-known actors, writers and comedians. Famous primarily for his comic efforts, such as the television series Fawlty Towers and the exploits of the Monty Python troupe, John Cleese has also become a well-respected author in his own right and has co-written such books as Families And How to Survive Them and Life And How to Survive It . In Fall 2014, John released his memoir, So Anyway… . John Cleese grew up in the middle-class seaside resort town of Weston-super-Mare and enrolled at Cambridge University with the intention of studying law, but soon discovered that his comic leanings held greater sway. He joined the celebrated Cambridge Footlights Society – and was initially rejected because he could neither sing nor dance – but was accepted after collaborating with a friend on some comedy sketches. Cleese soon gained a reputation as a team player and met future writing partner and Python Graham Chapman. John Cleese entered professional comedy with a writing stint on David Frost’s The Frost Report in 1966. While working for that BBC show, Cleese and Chapman met fellow Frost Report writers Eric Idle, Terry Jones, and Michael Palin. They were soon collaborating on what would become Monty Python’s Flying Circus with Terry Gilliam. The show, which first aired in 1969, was an iconoclastic look at British society: its genius lay in its seemingly random, bizarre take on the mundane facets of everyday life, from Spam to pet shops to the simple act of walking. John Cleese stayed with Monty Python for three seasons; after he left, he reunited with his fellow Pythons for three movies. The first, Monty Python And The Holy Grail (1974), was a revisionist take on the Arthurian legend that featured John Cleese as the Black Knight, who refuses to end his duel with King Arthur even after losing his arms and legs. Life of Brian followed in 1979; a look at one of history’s lesser-known messiahs, it featured lepers, space aliens, and condemned martyrs singing a rousing version of “Always Look on the Bright Side of Life” while hanging from their crucifixes. The Pythons’ third outing, the 1983 Monty Python’s The Meaning of Life , was a series of increasingly outrageous vignettes, including one about the explosion of a stupendously obese man and another featuring a dinner party with Death. But John is far from your garden variety entertainer. From the beginning of his career he has continually parlayed his enormous talents into advancing the political causes he believes in (he is a vocal supporter of the UK’s Labour Party); promoting education (a former Rector of the University of St. Andrews, he served as a professor-at-large at Cornell University from 1991 through 2006); and teaching business skills (the training videos created by his Video Arts production company are viewed by millions of people in the UK and abroad). 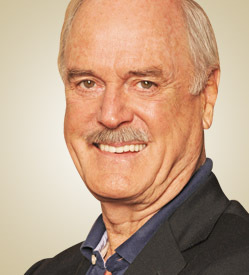 Cleese enthralls packed audiences worldwide. Whether he’s coaching novice comedians, discussing his liberal politics, or imparting his formulas for success in education, business and life, Cleese always leaves audiences clamoring for more.